Laguarda.Low Architects, an internationally acclaimed architecture design and planning firm, has designed a new retail development in central Fuzhou, China. Laguarda.Low Architects, an internationally acclaimed architecture design and planning firm, has designed a new retail development in central Fuzhou, China. 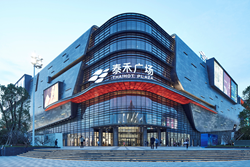 Located at a major intersection in central Fuzhou, Thaihot Plaza is a striking, new 1.4 million-square-foot retail center consisting of a six-story luxury shopping mall to the south, and a large public plaza with three levels of outdoor shops and restaurants to the north. “We are excited and honored to have designed this destination retail and commercial complex. In this large-scale project, we sought to create a luxurious yet inviting environment, offering convenience, comfort, and lifestyle amenities for shoppers and visitors alike,” said John Low, Principal at Laguarda.Low Architects. Thaihot Plaza is orientated to various transit modes and is conveniently located near a growing residential and commercial district, where shoppers will arrive either by foot or automobile. Amenities at the complex include a fully automated fountain with synchronized lighting and music for special water shows, an IMAX theater, and a variety of restaurant options. The indoor and outdoor programs complement each other and offer a range of environments for a modern and sophisticated shopping experience. The outdoor plaza serves as the central social space of the development. Three levels of shops and restaurants surround the expansive open-air space with views of the surrounding city. Contiguous glass storefronts, wide stairs with integrated lighting, and a large LED display above the mall entrance promote activity throughout the space and create a dynamic environment. A curvilinear skylight with horizontal and vertical glazed surfaces covers the grand atrium of the indoor mall and fills the all six levels with natural light throughout the day. Above the transparent and delicate glass volume, a dynamic metal skin wraps the building. Top grade natural and manufactured materials were used in both the interior and exterior of the mixed-use complex, creating an environment of luxury experience for shoppers. Granite stone paving and facades, aluminum framed storefronts with glass canopies, glass and stainless steel railings, and red clay tile and zinc are woven into a beautiful and unique design aesthetic. Laguarda.Low, based in New York City, is well known for their mastery of mixed-use and commercial projects throughout the world. Laguarda Low Architects is an award-winning architecture practice in New York City with a vast portfolio of built work throughout the world. Over the firm’s 16 year history, Laguarda.Low Architects has completed numerous projects, including large-scale master plans, mixed-use developments, office and residential towers, hotels, and retail centers. With a close-knit, creative and international staff of over 50 design professionals, Laguarda.Low’s work is driven by the desire to create vibrant and unique visitor experiences that enhance the client’s overall vision for the project.